The last time Mesi was in this part of India she stumbled across a cave that the great Indian sage Padmasambhava once meditated. She was so struck by the powerful nature of the space, that she dropped her other plans to spend more time near the Taktok monastery which surrounds the cave. Through a series of fortunate events, she ended up in a home stay with a lovely Ladakhi family – Jigmet, his sister Tashi and their mum. It was such a great, pure experience that she vowed for years to return to this village to introduce me to them and revisit the monastery. 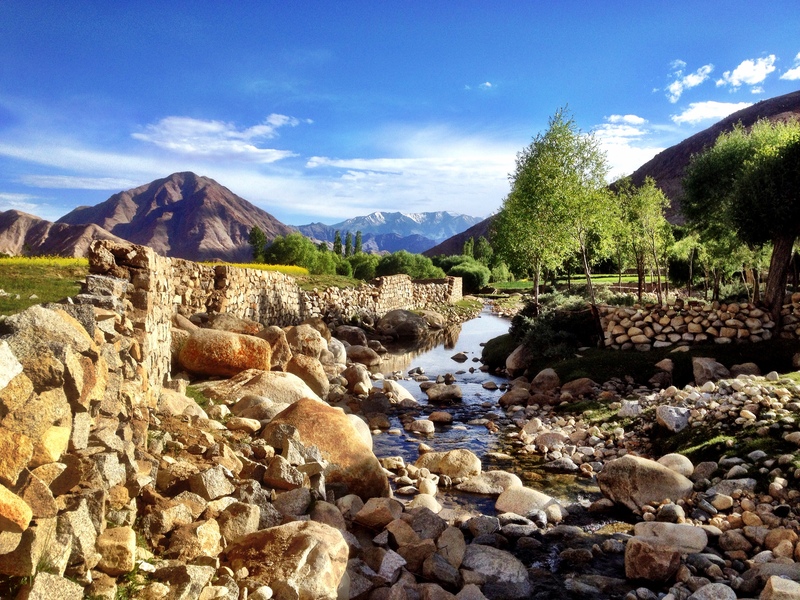 We had been in Leh for about a week – recovering from sickness and going to the Kalachakra – and I was itchy to get out and explore rural Ladakh. Sakti was the natural place we’d go to first. With a few hasty phone calls, we organised a two-night home stay with the family. From Leh we hired a taxi and, after a one hour journey, they dropped off us at the point where Sakti meets the main highway to Leh. With no cellphone coverage and thus no way to get in touch with Jigmet (English name: Jimmy), we relied solely on Mesi’s memory to navigate us to the right house in Sakti. But if one were to get lost anywhere, it would be Sakti. The village is the epitome of idyllic, rural beauty. For two hours, we wandered through green fields, spotted with orange boulders and brown calves. We walked past alternating terraced plantations of barley and mustard flowers, which created a stunning patchwork of green and yellow across the landscape. The Ladakhis have created a charming system of small streams and waterfalls to irrigate these fields, and part of our adventure involved jumping from rock to rock as we criss-crossed various waterways. If it were even possible to make this scene more beautiful, every time we looked up we saw snow covered mountains of the Himalayas in the distance. It was beyond amazing. 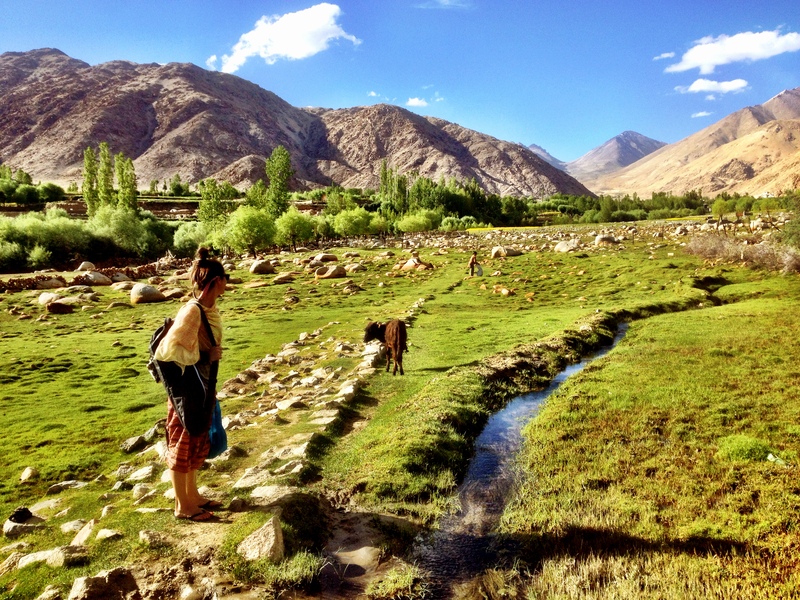 Along the way, of course, we would bump into a Ladakhi villager and yell out “Julley! Padme Jigmet?” in the hope someone could point us in the right direction. Every single time we were met with a warm Julley and a quizzical look. No-one seemed to know where the family lived. Eventually, as the sun was setting and we were getting desperate, we hitched a ride with a car of 20-something year old boys who thankfully spoke English and drove us to the family. We happily arrived at the front of the house and yelled out Julley! Jimmy looked out the window. In comical fashion it took him a second to register us, before he bolted down to his front gate to greet us warmly. We later found out that Jigmet is the Hungarian equivalent of Gabor (or the English equivalent of John), and is so common that it doesn’t really narrow down a search for a given man in a village of 500 households. What we should’ve been saying was “Zumskit?”, which is the name of the house. Zumskit means ‘Happy Gathering’ in Ladakhi, and there couldn’t be a more apt name. We had a great time staying with Jimmy and his family, living for two days with the locals. We explored the fields where they grow barley. 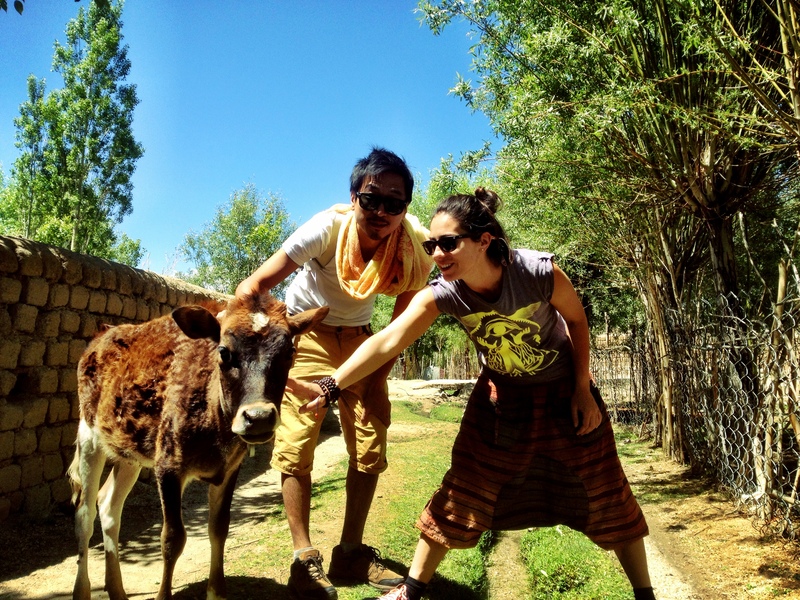 Jimmy’s mum milked a cow and we had some fresh, unpasteurised Ladakhi milk mere minutes later – milk straight from a cow tastes much sweeter than I expected! On the second night we had an impromptu cooking lesson as we helped Jimmy’s mum make a Thantuk – a traditional noodle stew. We also visited several monasteries and the cave (a post dedicated to Ladakhi monasteries here). What struck me most about the family was the sheer purity of their existence. Tibetan Buddhism is infused in their daily life – every morning Jimmy’s mum burns incense in each room to ward off evil spirits, her hands are moving through mala beads whenever they are free, the family has strung prayer flags over their house. You could see in Jimmy’s mum’s face how important it was for her that the family went to Kalachakra to receive the Dalai Lama’s blessings. 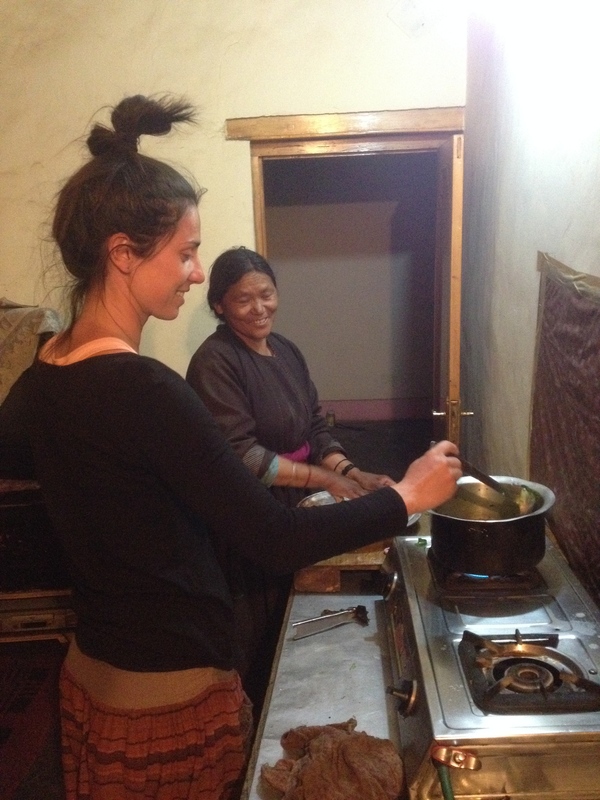 Moreover, they were extremely generous with us – they put us up for two days, fed us, never stopped offering us butter tea (a salty tea made from water and yak butter – tastes as good as it sounds), didn’t let us do anything, and didn’t take any money. You could hardly hope for a better experience of Ladakhi village life in Sakti. Maybe one day, we’ll get lost here again.